AUSTIN, Texas – For better part of three days at Austin Country Club, Tiger Woods emitted a vibe of frustration. Quirky course. Indifferent putting. Questionable decisions. And Woods holed an 83-yard wedge shot Friday afternoon that changed everything. The eagle at the 13th hole propelled Woods to a. 4 and 2 victory over Patrick Cantlay and – coupled with Brandt Snedeker's 6 and 4 loss to Aaron Wise – a victory in his group at the WGC-Dell Technologies Match Play Championship. He will face Rory McIlroy in the Round of 16 on Saturday morning with the format being straight knock out through to Sunday's final match. McIlroy advanced with a 4 and 2 victory over Matthew Fitpatrick. "It's exciting," McIlroy said about facing Woods. "It's exciting for the tournament and it's going to be exciting for us. I feel good about my game. I've played well every year. "I need to get better than I did in Atlanta last year," McIlroy said. "I didn't have much of a game that day." Cantlay was far less familiar, having played just one round with Woods, and there were several key points in the Woods-Cantlay match, the hole-out. for eagle was huge, as it helped Woods erase a 2-down deficit through 8 holes and go 2-up with just five to play. "I laid up to make sure that I put pressure on him on that tee shot, if he was going to go for it, "said Woods, who hit his tee shot 222 yards on the hole guarded by water on the left – and where he hit it against Snedeker on Thursday, taking a penalty. "I saw his hand go to the driver a couple of times, and they were talking about it. 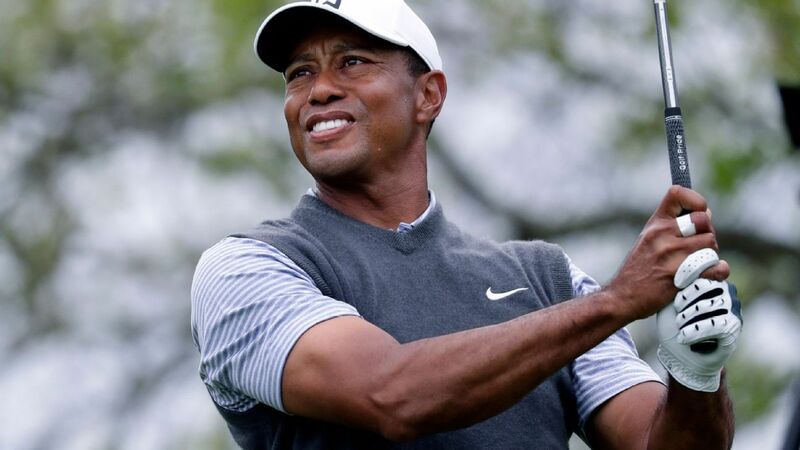 Woods used on a 60-degree sand wedge from 83 yards to land the ball approximately pin high, then saw the spin back and trickle into the hole for a 2, eliciting big cheers and a couple of fist pumps from the three-time winner of this tournament. Cantlay, 27, a one-time winner on the PGA Tour who is ranked 19th in the world, put up a fight early, making birdies at the third, fifth and sixth holes to go 1 up. He then took a 2-up lead despite a tricky drop from a cart that left him in trouble, only to see Woods miss the green, hit a poor chip from the fringe and miss a 6-footer for couple and make a bogey. "But got a bad break on 9," Woods said. "Hit a really nice drive down." there, caught the hill, went in the hazard. And I was able to win that hole, grab a little momentum going into the back nine. Woods squared the match by making a 20-footer for birdie at the 11th, went ahead when he birdied the par-5th 12th while Cantlay could not match. Stretch from the 11th to the 16th in 6 under par. Woods, who went 2-1 in his group, needed Wise to defeat Snedeker in order to advance; , Woods would have gone to a sudden-death playoff with Snedeker. on the 14th. Woods said he never paid attention to the other match until he was almost over because "I needed to take care of my own match. It's irrelevant if I lose my match. ""